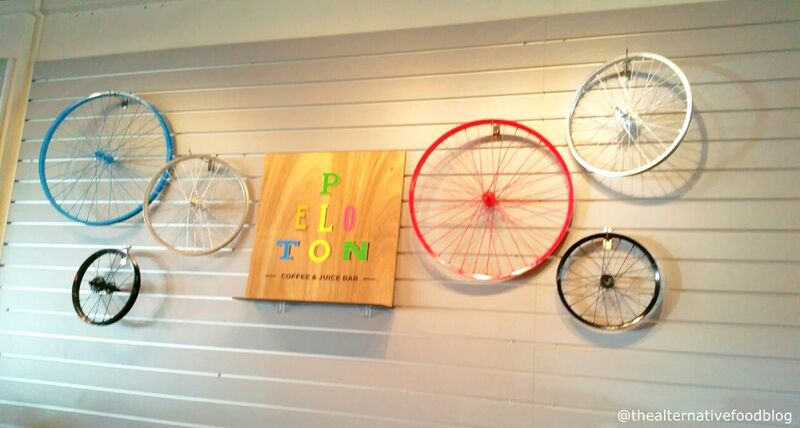 Co-owned by one of the owners of Penny University, Peloton is one of the newest cafes/cycling pit stop in town. Shereen learned of Peloton through a friend who was participating in a flea market at the newly-opened café, and upon learning that Peloton is a halal-friendly eatery, we decided to make our way down to have breakfast there and to support the entrepreneurs at Flea to the East last Saturday. 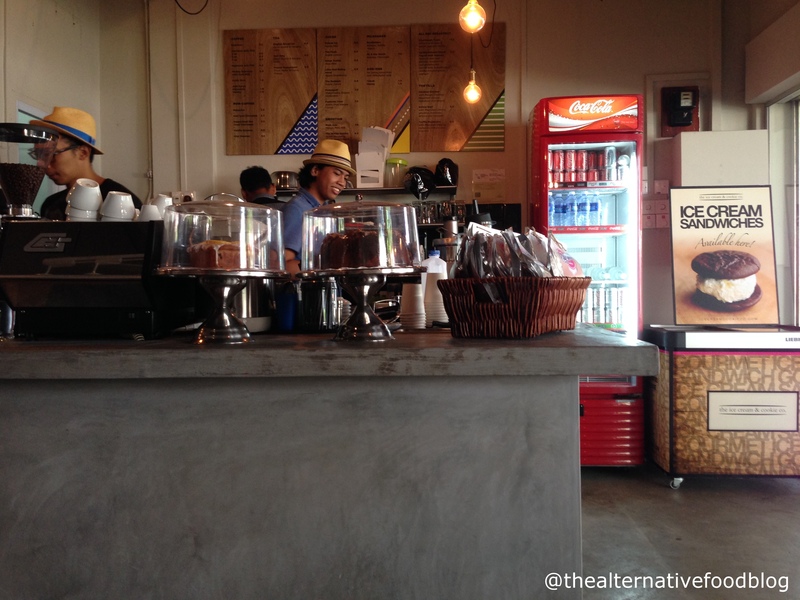 Peloton is located in Changi Village, an approximate 5 minute walk from the famous hawker centre, and about 2 minutes away from Chock Full of Beans. Inspired by cycling pit stops common in Europe, the owners of Peloton conceptualised their café and their menu with cyclists in mind. The café interior is rather spacious and can easily sit up to 15 diners, and there are plenty of seats outside, with amble space for cycling enthusiasts to park their two wheelers while they grab a quick bite and some rest before they continue on their journey. 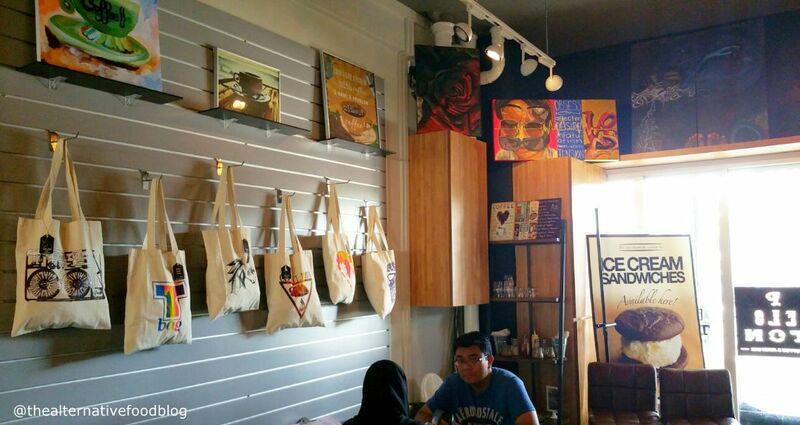 The walls are lined with art works from local artists and they even have tote bags from Unic|Owns on sale! While I navigated my way to Peloton, Shereen was having a hard time trying to get a parking lot. Parking is not the easiest here given the construction that’s going on at one of the two main car parks so you may have to wait for parking and perhaps, get friends to place orders and get a seat first, which is what we did. The process of ordering food here is very much similar to that at Penny University. You peruse the menu, decide on what you will like, go up to the counter to order and make payment, take a seat and wait for your food to be served. The owners and staff were very friendly and interactive, and it made the ordering process a pleasant and efficient one. Since Shereen and I went for a morning run before ending up at Peloton, we were ravenous and ready to order huge breakfasts.I was particularly looking forward to a scrumptious breakfast of eggs Benedict and waffles and so it goes without saying that I was disappointed to find that there were no eggs Benedict or poached eggs on the menu. 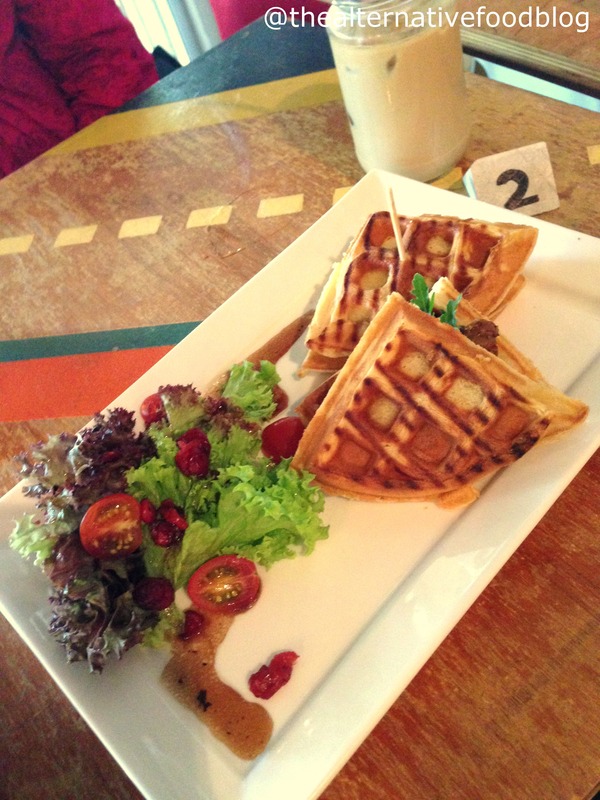 However, the discovery of savoury waffles on the menu cheered me up. Together with Shereen’s cousin who joined us for breakfast, we ordered two Muddy Espressos (SGD$6.50) , an Iced Tea (SGD $4.50), The Incredibles (SGD$6.00), a Yogurt Parfait with Granola (SGD$6.00), two Smoked Salmon Bruschettas and Salads (SGD$9.90), and a Truffle Mushrooms and Salad with waffles (SGD $7.90). The Muddy Espresso needs no introduction as fans of coffee and Penny University would be familiar with this wonderfully robust and smooth coffee. The Muddy Espresso here is equally satisfying with its shots of espresso and the right balance of milk. Shereen and I are never disappointed with this beverage. Other than coffee, I also order a glass of fresh juice to hydrate myself after the morning run and to get my boost of vitamins. The Incredibles is a mix of watermelon and orange juice, and it certainly packs a vitamin C punch. 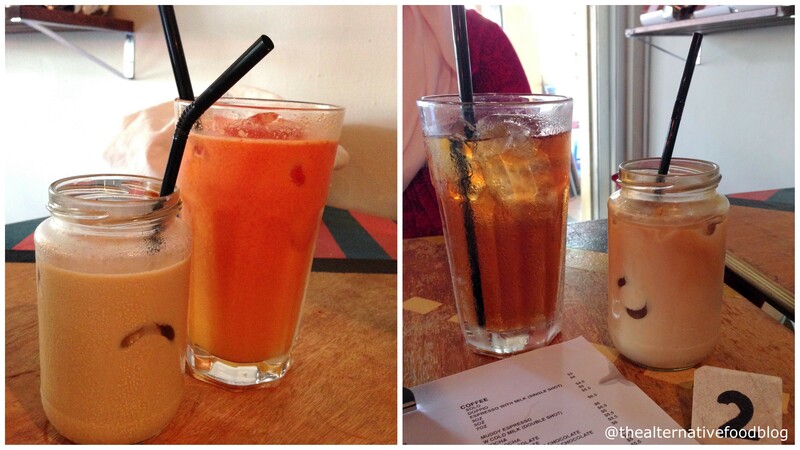 What I like about the juice here is that fresh fruits are used and the serving is huge, and not diluted with ice. The combination of watermelon and orange makes this juice a very refreshing beverage and a definite healthier start to the day. Shereen ordered a Smoked Salmon and Bruschetta with Salad, served with sourdough bread, while her cousin had the same order but served with waffles. 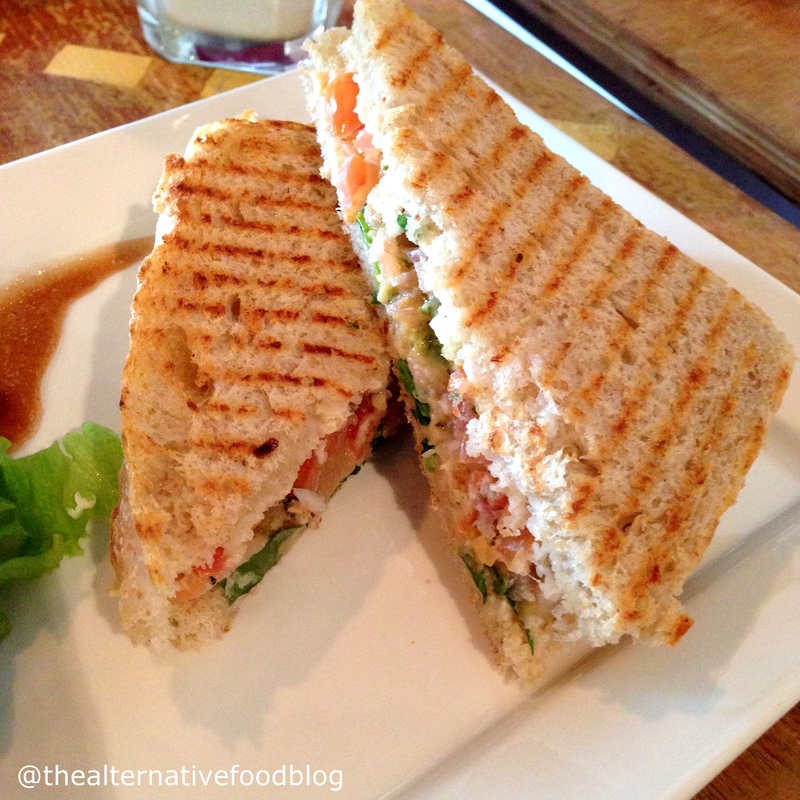 The interesting thing in Peloton is that you can choose from sourdough (additional SGD$2.00), pain du monde bread (additional SGD$2.00), or waffle (additional SGD$3.00) as the wrap of your savoury sandwich. According to Shereen and her cousin, the slices of smoked salmon were fresh and the texture of the smoked fish was smooth and easy on the palate. The combination of bruschetta filling, wild rocket, cheese, and dill sauce provided a balance to the saltiness of smoked salmon, giving the sandwich a well combined flavour. Shereen thoroughly enjoyed her sourdough bread while her cousin was very satisfied with the combination of smoked salmon bruschetta and waffles. 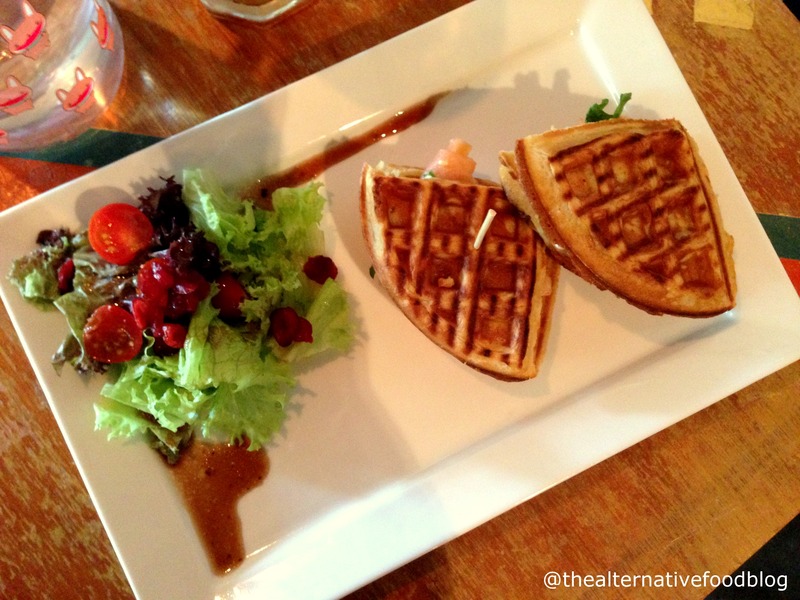 The fluffy waffles, with a slight crispiness on the outside, complimented the smoked salmon very well. 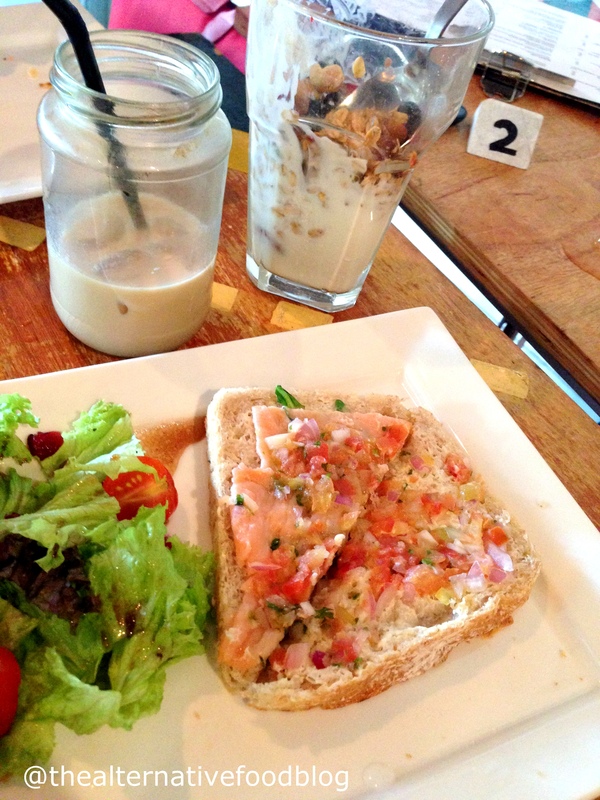 In their opinion, the Smoked Salmon and Bruschetta with Salad is definitely a must-have when you visit Peloton. As for my Truffle Mushrooms and Salad with waffles, it was the best breakfast I had had that week. The garlic spread on the waffles was so fragrant, I could smell its aroma when the plate was set on my table. Fans of garlic will be extremely pleased with this sandwich as the garlic spread certainly provides another layer of taste to the sauteed truffle mushrooms. 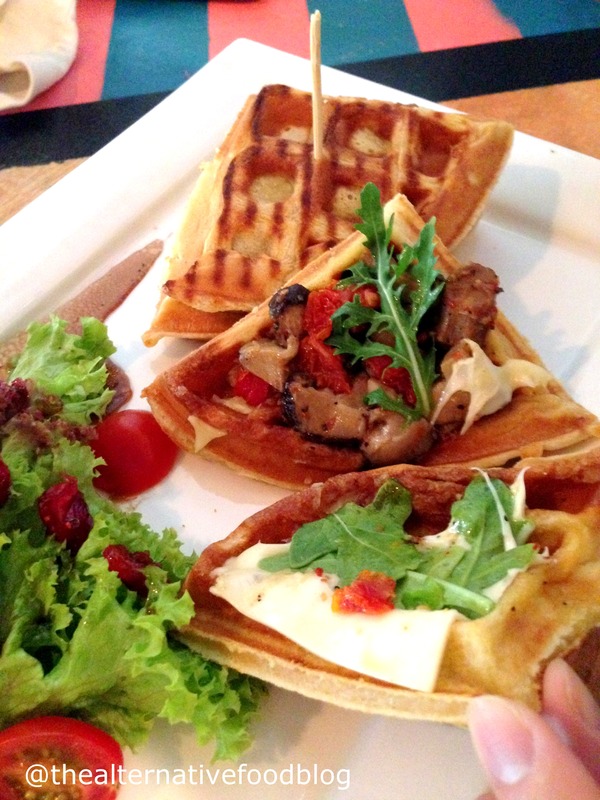 I especially love the combination of aromatic garlic and savoury truffle mushrooms with my slightly sweet waffles. While some might be wary of the aftertaste of garlic and its lingering smell in the mouth, this dish, with its garlic spread, did not leave me with garlic breath. The side of salad tossed in balsamic vinegar – which is served with every savoury dish – cleanses your palate and removes any excessive garlic after taste in your mouth. The delicious waffles with sauteed truffle mushrooms certainly made up for my initial disappointment with the absence of eggs benedict on the cafe menu. 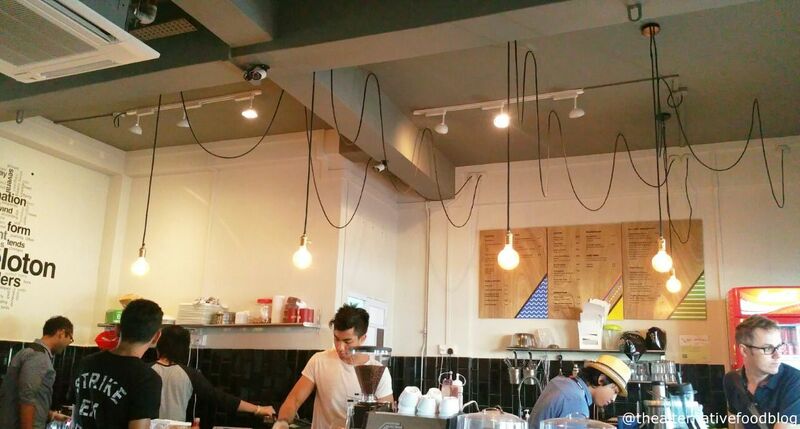 A unique feature of Peloton is its semi-open concept where orders are plated at the open coffee bar and cashier after they’ve been cooked in the kitchen. It was indeed a unique dining experience to watch our food being arranged and garnished right before they were sent to our table. As the entire plating process is open to the diners, we can be assured that our orders are freshly prepared and handled properly. 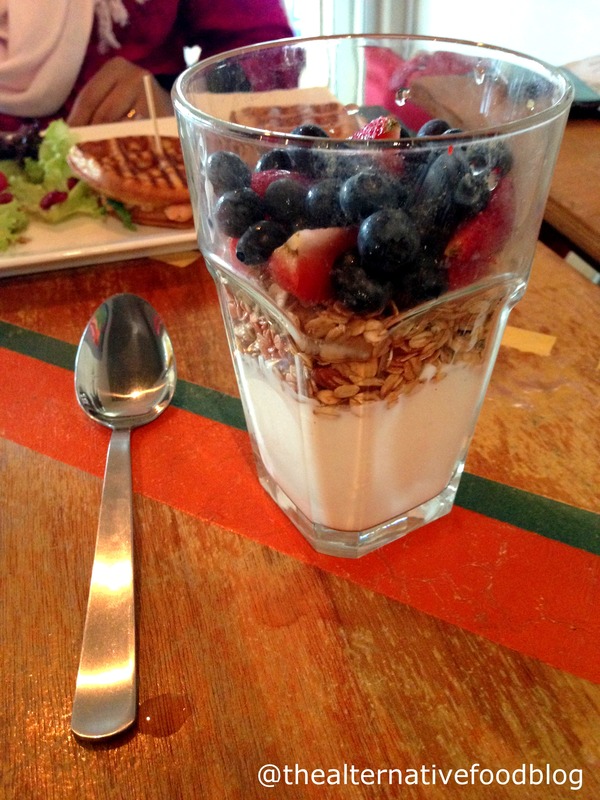 Not only that, the plating process allows us to have a sneak peek of other dishes and in some instances, persuaded us to add on to our orders, as was the case of the Yogurt Parfait with Granola. 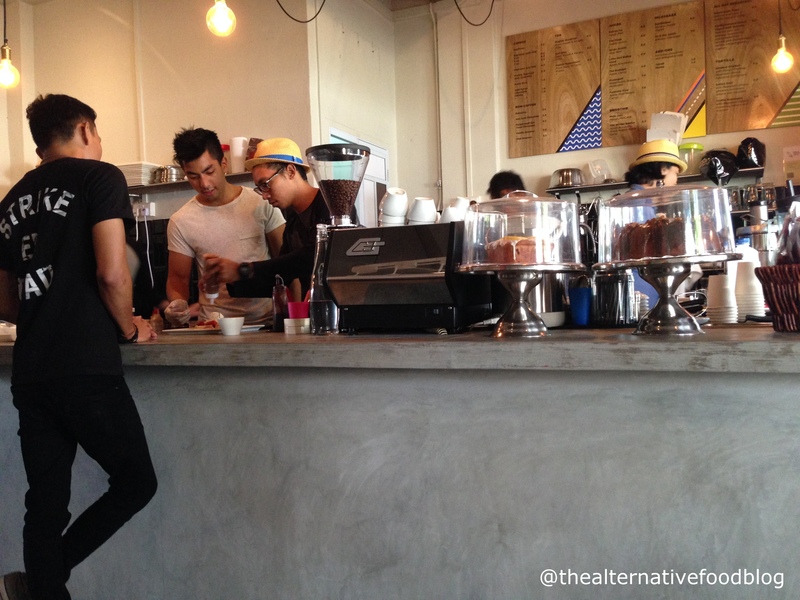 We had placed our orders and were sipping our coffees and tea when we saw a serving of Yogurt Parfait w Granola being prepared at the counter. 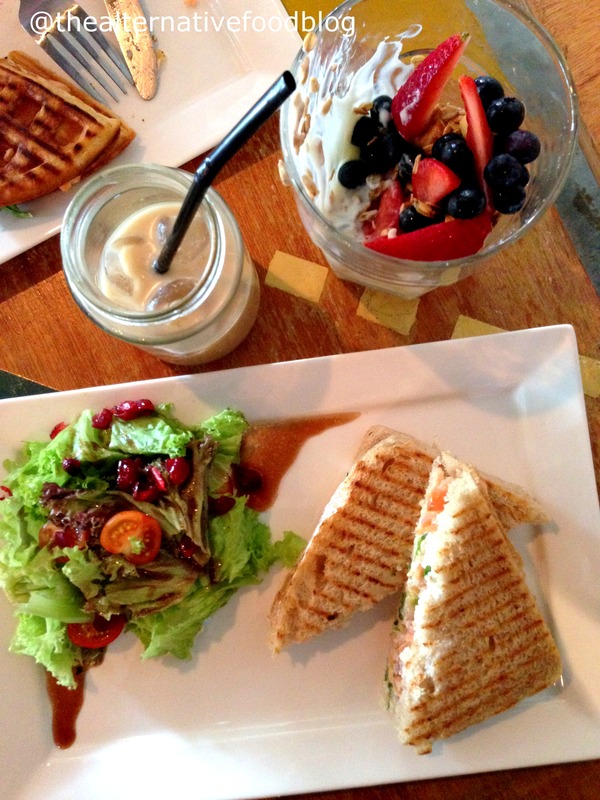 The beautifully layered parfait and the colours of the different berries were reasons enough for us to make an addition to our order of savoury waffles and sandwiches. When Shereen placed her order, one of the staff even asked her if she ordered the dish after seeing it being prepared. 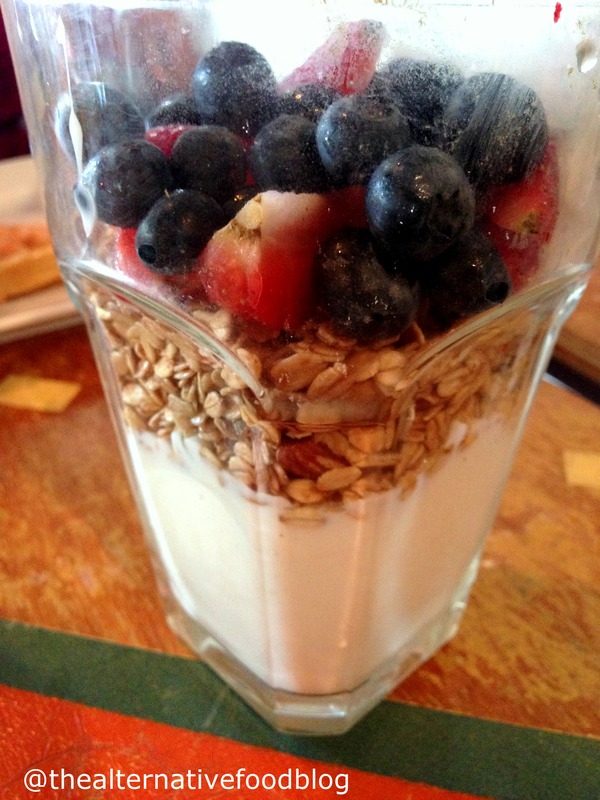 The Yogurt Parfait with Granola did not disappoint. According to Shereen, the blueberries and strawberries were fresh, and the drizzle of honey gave the yogurt its tinge of sweetness, and the granola mix gave some crunch to the creamy and smooth vanilla yogurt. The combination of fresh fruits and granola with yogurt makes this another of Shereen’s must-have breakfast item at Peloton. As with their serving of juice, as they were so generous with their serving size, this dish can be filing for people with a small appetite. As we munched on our breakfast and sip our coffee and teas, we were reminded that most of the dishes on the menu were not only well-balanced, but also healthier than most breakfast or brunch menu. The variety of smoothies and fresh fruit juices is appealing, and the menu definitely reflects the owners’ vision of serving healthy food and drinks to cyclists and other sports enthusiasts as they stop over at Peloton to recharge. We were very impressed with Peloton, and pleased to know that while it may give off some Penny University vibes, it is unique on its own, with its semi-open concept and its dedication to serving healthier food. We know that we will definitely be back soon, and the next time, we will order the sweet dishes that we missed out on. How to get there: Nearest MRT stations: EW2 Tampines MRT Station. Bus Services to vicinity: 2, 9, 19, 59, 89, 109.